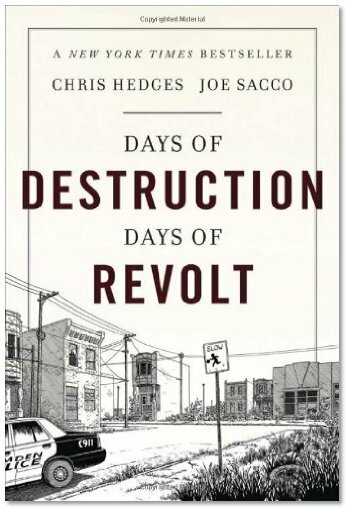 For those of you interested in criticisms of capitalism and the rise of corporate imperialism let me point you to Days of Destruction, Days of Revolt by Chris Hedges and Joe Sacco. Hedges is a Pulitzer-Prize winning journalist and Sacco an award-winning cartoonist. Days of Destruction, Days of Revolt combines Hedges' investigative exposé with Sacco's graphic novel skills to tell the stories of four "sacrifice zones" of late-modern capitalism. Sacrifice zones are places and populations that have been locally exploited--sacrificed--for capitalistic growth and corporate greed elsewhere. Media attention rarely, if ever, dwells upon these sacrifice zones, thus the vast majority of Americans are wholly unaware of the costs of capitalistic greed and the rise of the market state, what we might call capitalistic imperialism, where markets and corporate profit are seen the highest goods in a given society. The four sacrifice zones described in Days of Destruction, Days of Revolt are the Pine Ridge Reservation in South Dakota; Camden, New Jersey; Welch, West Virgina, and Immokalee, Florida. These are four the poorest places in America today and they tell the story of four different ethnic groups and how each has been exploited and sacrificed for corporate profit: the Native Americans, inner city blacks, rural whites, and Mexican immigrants. The story of the Native Americans is a story about land and mining rights, how the Native Americans were pushed off their lands and quarantined on reservations so that corporate American had access to silver and other mining rights in places like the Black Hills, a place sacred to the Native Americans like Jerusalem is to the Jews or Mecca to Muslims. The Black Hills were given to the Native Americans in official US treaties, ratified by Congress, to be theirs forever. As in...forever. That is until silver was found in the hills. Corporate greed then set the genocidal wheels of the American government and its military in motion. Guns and government in the service of capitalism. The effects of this profit-driven genocide are still being felt on Indian reservations which have some of the high addiction and suicide rates in the nation. The story of inner city blacks is the story of Camden, NJ, once a thriving multiethnic working class community. That is until cheap manufacturing labor was found oversees, breaking unions, shuttering factories, and creating chronic unemployment in many local communities. With massive job loss middle and working class class communities like those in Camden were destroyed, creating ghost towns where libraries and schools were boarded up. The story of rural whites is the story of how coal mining in the Appalachia mountains has destroyed forests, poisoned water supplies, and covered small towns in coal dust. More, as the labor in the mines was increasingly mechanized rural Appalachian communities suffered massive unemployment hits. Some of the poorest people in the nation along with some of the highest drug use rates are in these rural mountain communities. The story of Mexican immigrants, legal and illegal, is the story of the Big Agriculture, where cheap labor is being so exploited that it borders on slavery. In many cases it is slavery as workers are locked up and supervised with men holding guns. Florida is ground zero for slavery in America today. Let alone the fact that without unions and collective bargaining power these workers work in some of the most chemically hazardous workplaces in America today (due to pesticides and fertilizers). All to keep labor costs cheap so that corporate profits can be increasingly maximized. Hedges' narrative keeps the book moving with facts but in each chapter Sacco's artwork is used to tell, graphic novel style, more personal and intimate stories of loss, devastation and despair. Each chapter and the human stories leaves you will a feeling of rage--this book is not for the faint of heart--but Hedges and Sacco season this with anecdotes of people fighting for and recovering their dignity and humanity in the midst of capitalistic ruin and rubble. The book finishes its tour by visiting Occupy Wall Street in Liberty (Zuccott) Park, New York. The book ends with the hope that the OWS movement, in the wake of its evictions from city parks, is the beginnings of a movement that will grow in both strength and numbers as the people try to reclaim an America where the collective and public good of the 99% is valued more highly than the corporate profit and greed of the 1%. The highest high school drop out rate (except for Spain). On a related note, a friend just introduced me to the work of Thomas Pogge, whose book World Poverty and Human Rights lays out a framework that I think is useful for thinking about these anecdotes in a more structured way. The truly crazy-making thing, for me, is that none of this is remotely necessary. The wealth produced by capitalism is primarily a result of technological improvements...exploitation has always been with us, but it becomes increasingly inexcusable and unjustifiable as a result of capitalism. As wealth accumulates, smaller and smaller relative transfers of wealth into education, infrastructure,healthcare and community support yield larger and larger returns. And yet, we keep transferring resources away from these areas and into hand-outs for the rich. One other point: It looks like those statistics may be a little dated. In 2008, Portugal and Denmark might have had slightly shorter life expectancy at birth than the US. Since then, they have easily surpassed us. In just 4 years. http://data.worldbank.org/indicator/SP.DYN.LE00.IN I suspect this has something to do with the fact that women with a high school degree have apparently seen a shocking collapse in life expectancy in recent years. http://www.forbes.com/sites/timworstall/2012/09/22/falling-life-expectancy-in-the-united-states/ We are vastly more productive and wealthy than Portugal. The cruelty of our current approach to governance is utterly needless. I had a very interesting discussion with my 8th graders the other day. In discussing slavery and the South's willingness to die to keep it, I asked if it, slavery, was a moral issue or an economic issue. We agreed that is was both. I then asked if Bill Gates stole a loaf of bread from Wal-mart would it be wrong and they all agreed that it would be. I went on to ask if a good man who had lost his job and was struggling to feed his young kids stole a loaf of bread would that be wrong? Most if not all said that, under those circumstances, it would not be wrong. So my question then became does economics drive morality or does morality drive economics. We came to the conclusion that economics determines morality. So I tried to get them to see why the South believed that Slavery was good and right. Their morality was blinded by their economic status or a danger of losing it. I'm wondering if this is not the case 100% of the time. If you folks have any insight I would be interested. What would be the alternative to capitalism? I also asked my kids to look at where their clothes were made. Another place where our economics determines our morality. I wouldn't work for $2 a day but I don't mind wearing clothes made by those who do! I think this question shows how badly these issues are generally framed. And to be fair, Chris Hedges sometimes contributes to this framing. The reality is that capitalism doesn't require this kind of exploitation to succeed, and in fact, this kind of exploitation makes capitalism less successful in the long run. The wealth that capitalism produces is primarily a result of technology, not exploitation. Think about it: people have been exploited for millenia, but only with the advent of the industrial revolution has widespread prosperity become possible. However, even as capitalism makes exploitation unneccessary, it also makes it easier. And so you end up in a situation in which exploitation and gross inequalities are utterly indefensible and needless, but in which they often intensify. I'm no expert but it seems the only way to stop exploitation would be for the government to regulate prices and salaries and our government is infected with the same greedy virus. I don't think there is any morally clean solution. And that's sort of the point in pondering locations of capitalism's failure. Just because capitalism might be "best" (though people will debate that) doesn't mean that it doesn't create damage. Being honest about that damage is important for a few different reasons. First, it helps us resist the idolatry of equating the market with the Kingdom of God. Second, it makes our victims visible. And third, by making those victims visible we assume a moral burden to care for them and seek justice for them. Chris Hedges is always interesting. You can tell when he has read a difficult book because he subsequently becomes its prophet. For a while it was Sheldon Wolin's Inverted Fascism; these days it's Joseph Tainter's Collapse of Complex Societies. He's like a Jeremiah in search of a Torah. I've read most of his books but not this one. I find Hedges' work a good counter balance to other books of this type, The Road to Serfdom for example. They are emotionally-stirring calls to arms, with well-made (albeit limited) points, but they are too simple to truly address the issues. As such they dead end in siren calls for Libertarianism or Progressivism or Conservatism or Liberalism or any number of things. Sure economics "determine" their own moralities, but aren't these moralities the "powers" referred to a while back? Aren't these values schemes in the service of idols: class, country, tradition, innovation, profit? This is why I find all such siren calls interesting, but ultimately tragic. They are attempts to mobilize the servants of one idol against the servants of another, which holds for a time, until the cycle repeats a new idol is brought forth to vanquish the old. History lurches in its dialectical circle, the whirlwind gains in strength, and we find ourselves in days like these. For those of you who may know the history better than I do: Is the US the most religious of the advanced Democratic nations, and is there a connection between American religiosity and America’s creation of the most predatory incarnation of capitalism in history? I don't think that is true. Encouraging trade unions has generally been one of the most effective ways to stop workplace exploitation, and unions don't set wages or salaries. They negotiate them, through a process of rational discussion and engagement with the employer. Sometimes, this process is more rational. Sometimes, less rational. But when trade unions are given the backing, power and oversight to play this role, as the locally, democratically elected representative of workers, they succeed. (Look at places like Denmark or Germany.) You're right that our government is infected. Plenty of infections have cures. If we haven't found the cure for this particular infection yet, that is a reason to keep looking...not a reason to despair. The good news is that we now know quite a lot about good governance and how to do it, at least at this basic level. A lot of this is just political will and implementation. I really want to get to a point where we are debating the relative spiritual merits of investments in art, versus more investments in research. Or the trade-offs between higher total productivity as a nation, versus working 3 or 4 day weeks. That is what politics can and should look like. The fact that ours doesn't is a result of us fighting rearguard actions against entirely indefensible ideas that belong in the dustbin of history...like the idea that there is a trade-off between growth and inequality, which gets the facts all wrong. I'd expect so. And that's really interesting. I think there is something to this. Max Weber said as much in The Protestant Ethic and the Spirit of Capitalism. As I said in my original post, I think that economics drives morality or in this case religion. We've allowed our views of capitalism to seep into our churches. The bigger the better. The richer the more blessed. American exceptionalism - with a vengeance. Some of you may know that I'm an expat Yank who has just retired from pastoral ministry, having lived in the UK for 40 years. But believe me, notwithstanding the biblical numerical symbolism, it's not Britain that seems like the wilderness. The NHS alone has made living in London, Oxford, and (for 31 years) Swansea (for the geographically challenged, that's in Wales) more like a paradise compared to large demographic swathes of wasteland in the US. In the future, when my neighbours ask me, "Now that you've retired, will you be returning to America? ", I'll smile, say, "Er, no" - and direct them to this revealing, if embarrassing, blogpost - for which, as ever, I thank you, Richard. BTW: If Weber was right, he was right about a debased form of Protestantism. As John W. de Grunchy observes in his recent John Calvin: Christian Humanist and Evangelical Reformer (2013), citing Ernst Troeltsch, Calvin was the source not of modern but of Christian socialism - which, of course, is a dirty word in the US. Sorry: that should be "modern capitalism" in the last line of my comment. I'm not against Christian Socialism. I'm against American Socialism. One is love the other is forced. 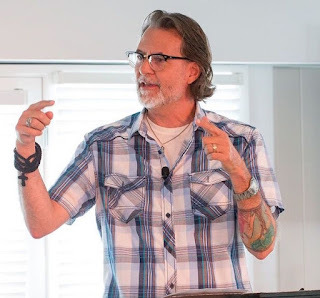 I think a certain kind of cultural religiosity can serve as a mask for corruption, exploitation and fear, and this has little to do with the Gospel. Maybe good governance is bad for bad religiosity. But really, history only runs once (as far as we know), and a relatively small number of countries have gone through these historical transitions; they have played out in different ways in different places. To offer just one other variable that is worth considering: countries with established churches have seen precipitous drops in religious observance. So maybe the problem is simply that state-run religion hasn't been able to survive the post-war dream. Thanks Kim. And blessings on your retirement. I hope this email finds you, and finds you well. I've been following your final sermons on Faith and Theology and have been enjoying them very much. I've always loved your work. This is a note of thanks for your very kind and generous endorsement of my book. Given how much I respect you theological acumen and pastoral heart I'm deeply touched. Richard, I felt unbelievably honoured to be asked to do the endorsement. I didn't get your email - perhaps it has to do with my change of email address (it's now kim_fabs@hotmail.com) - but it's a delight to read it (publicly!) here. I'm glad you like the sermons; but I must say, compared to your gigantic work, mine is dwarfish! Setting up the issue - from a sociopolitical/economic standpoint - as a binary is part of the problem. The developed countries got to where they are today by deploying mixed economies. We regulate where necessary, we open markets where necessary, we socialize where necessary. Capitalism, socialism, etc. make crappy ideologies/values, but they can be excellent tools. The problem in USAmerica is that, while our system reflects a mixed economy, some of us seem stuck on this sacrosanct idea that markets are somehow "magical." And they seem that way when they work (especially to those for whom they "work"). But they don't always work for everyone, and their down-sides are in desperate need of a very public unmasking. That doesn't mean you get rid of capitalism. It just means that you view it as useful only for certain purposes and in certain circumstances. Ah yes, the evils of capitalism er maybe communism, er maybe socialism, er maybe just Roman oppression and economic rampaging for wordly go it real?ods. How about we just start conqueroring nations and exporting everything they have back home (a very constant technique in the past). I know, let's set up colonys, enslave the people who live there, and exploit that way. Pick a time, pick a century, pick a country, pick a people, a society, tribe and you will have the same, sad story. So, does this book pose the question and the solution-"What will we do?" The recent events in Washington show that government is not the answer, oh by far iseizet is not. Seize all property and distribute to all? Uh, that was tried and it failed too. I suspect it is humans that are the solution. We do both good, great things and very, very, bad things. The more we work to spread the good, the less the bad? 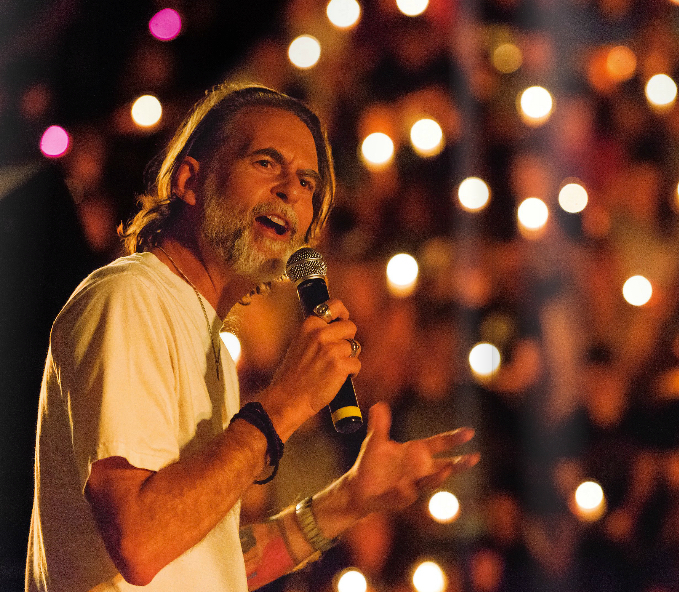 Not just living for Christ, but spreading His message? I discovered Hedges a few months ago. His "Empire of illusion: the death of literacy and the triumph of spectacle" is brilliant (though certainly not for the faint-hearted).